A perfect present for your Grateful pooch. 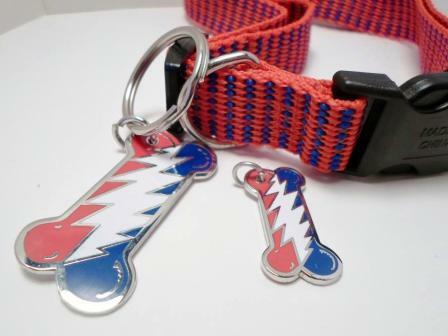 This standard size metal Grateful Dead lightning bolt dog charm is approximately 1 1/4" long and is engraved on the back with "Grateful Dog" . The large size is about 2" long, also engraved and is more suitable for larger breeds. They both look great, especially when hanging from one of our Grateful Dead Dog Collars. Grateful for the service. My little girl wears it with pride. It was amazing to actually be able to see the new bounce in her step. My dog is the coolest hound in the neighborhood sporting this cool bolt tag-a must have for all Grateful Dogs! Very cool, well made. The bigger size is perfect for my 75 lb dog.